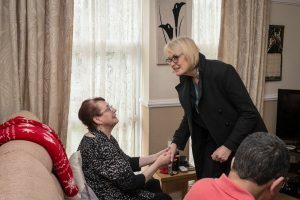 Minister for Digital and Culture, Margot James, has been in Liverpool to find out how 5G technology is helping to improve the delivery of health and social care services to people in Kensington living with long-term health conditions. 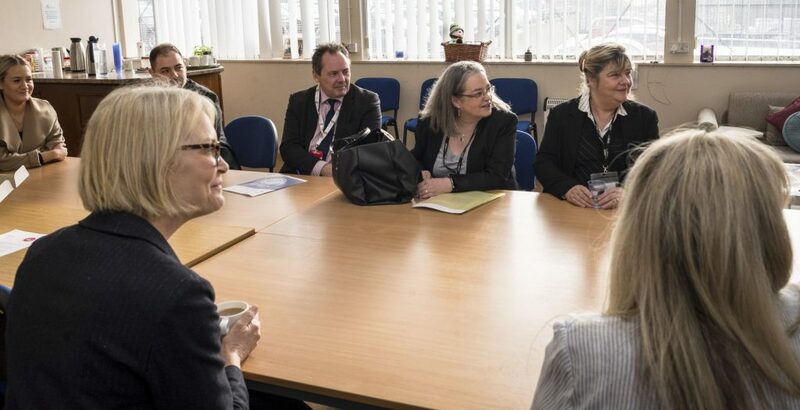 She met with the 5G testbed team in Sensor City (including eHealth Cluster Director, Rosemary Kay) to find out what the project is all about, then was taken by Rosemary and other team members to meet some people using the equipment. The minister visited the Liverpool home of Catherine Miller and her partner Kenneth Farrag who are trialling the technology. They live semi-independently in their own home, run by CIC in Kensington, and as part of the 5G trial they have had a Safehouse Sensor and PAMAN pharmacy assistant installed in their house. The Safehouse technology detects falls, changes in temperature and unusual behaviour patterns, which enables Catherine to live at home as she gets older by alerting care providers if they need to visit her – removing the need for unnecessary visits. PAMAN provides a video link to a local pharmacy, helping people to take medicines at home safely. The technology allows Kenneth to manage his diabetes himself, whilst continuing to enjoy the independence and social interaction he gains from having a job at Iceland.